This is part 4 in a series on fishing rigs. The Lindy Rig is perhaps the most versatile of the fishing rigs. Learn all the parts of the Lindy Rig, learn how to tie it, bait it, and how to fish with it. First, tie your leader line to one end of the barrel swivel and set it aside. 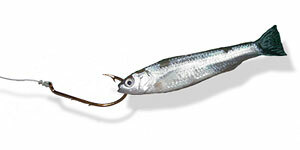 Then, slide the sinker on to your main with the "foot" of the weight pointing toward the end where your bait will go. Tie your main line to the other end of your barrel swivel. Now, tie the loose end of your leader line to your hook. Use the Clinch Knot to tie your hook to your line. This fishing knot hardly ever fails. Put a little spit on the line as you pull it tight. The Lindy Rig can use almost anything living or artificial for bait. Live bait rigging is similar to the Texas Rig. When using a plastic worm or night crawler, hook it through the thick part of the head about an inch down. Move the plastic worm or night crawler head all the way to the eye of the hook. Finally, hook the worm again just a little higher up the body where the barb of the hook rests against its body. Do not puncture all the way through the worm, rather hook into the body and allow the barb to rest inside the worm with the barb pointing upward. If you use a minnow hook it just behind both lips. This keeps the minnow alive, and allows it to swim freely. An alternative would be to run the hook through the open mouth and out a gill slit. Then run the hook through the base of the tail with the barb of the hook pointing upward. Walleyes love to eat a minnow leaving the head on your hook. Rigging a minnow in this fashion forces the walleye to take the barb of the hook. Leaches are another popular live bait and work great for Walleyes. 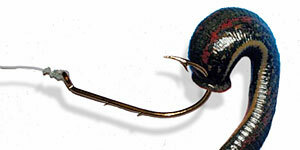 To hook a leach, just place the hook directly into the center of the head through the "sucker". Spoons, Spinners, and Crank Baits are also popular with the Lindy Rig. It is true that the extra weight can change or slow the action of the artificial lures, but it also gives a lazy presentation that works in cooler waters when the fish tend to slow down. The extra weight also allows the artificial lure to go deeper. Lindy Rigs are extremely flexible and the list of ways to fish them are too numerous to list. The only places I would not use a Lindy Rig would be in heavy cover or rocky areas where the weight and variable baits can hang more often than other rigs. Lindy Rigs can be used to troll for Pike or Walleye with live or artificial lures, but you may need to add heavier weight than I listed above to keep the bait below water. Like the Carolina or Texas Rigs you can use the Lindy Rig in pocket areas where you want to drop the bait into holes to lure out the big fish. Fish the Lindy Rig the same as you would with a Carolina or Texas Rig with small tugs, let the bait hit the bottom, and then reel in the slack. I use the Lindy Rigs in rivers where I cast up the current and allow the water to carry the bait until it rests parallel with the bank behind me where I then recast into the current. This is an excellent way to fish the most water for Pike or Walleye especially when fishing from the shore. Try wading out into the channel between your knees and waist using a leach, minnow, night crawler, or plastic worm. When using a spoon, crank, or spinner with the Lindy Rig, you will want to give the line more forceful tugs than you would normally. The extra weight in the line will absorb about 50% of your action. You will also need to reel the line in quicker to give the lure a more up and down presentation. What size fishing line do I use on a Lindy Rig. for my main line I use 8lb fire line.I run usually a one half oz walking sinker. I take a round file and enlarge the hole and smooth out all the rough spots to make sure the line runs through it freely. After the weight I put on the line a small chartreuse bead, but large enough that the weight can't pass over it. Then I tie on a small snap swivel,use the smoothest one you can find. Now comes the Snell. I use 8 lb extra limp Trilene about 4 feet long to a #6 red Gamakatsu Octopus hook. In the warm months I use a small green, chartreuse or red bead just before the hook. I believe this gives the fish a focal point. After the water cools I don't use any bead, the more natural the presentation the better. I only use leeches. We have won a lot of money with this system. Go slow and use lively bait. Great article. Isn't it difficult to cast accurately with four feet of snell? Best site I have found in 20 years!!! >>>Isn't it difficult to cast accurately with four feet of snell? I've never seen anyone actually try to cast a lindy rig like a carolina rig. Depending on the water clarity, I run up to a 7 or 9 foot snell for walleyes. And sometimes, if bottom is slimey or mossy or full of snails or jagged rock, I add a float a half-foot ahead of the hook. I like to run a floating jig head as the weeds pop up. When I go to Minnesota theres no shortage of leaches but here in nebraska is a different story. Thanks for the article.